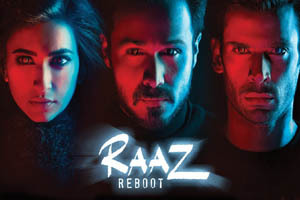 Raaz Reboot is a 2016 Bollywood film written and directed by Vikram Bhatt.The film jointly produced by Bhushan Kumar, Mukesh Bhatt and Mahesh Bhatt. It features Emraan Hashmi and Kriti Kharbanda in the lead roles, with Gaurav Arora in supporting role. The film is the fourth instalment in the horror film series, Raaz. The Music for Raaz Reboot composed by Jeet Ganguly, Sangeet Haldipur and Siddharth Haldipur, with lyrics written by Rashmi Virag, Kausar Munir. Here is the link of all the songs lyrics and videos of Raaz Reboot.